HTC unveils midrange U12 Life smartphone with Bluetooth 5 and aptX HD | What Hi-Fi? The U12 Life has a 6in, Full HD+ screen, stereo speakers, and a big battery for its budget price tag. It’s safe to say HTC's flagship U12+ didn’t set the smartphone world alight. The great camera and punchy performance ticked all the right boxes, but its quick-draining battery and hypersensitive touch buttons meant the flagship phone wasn’t all that great to use on a daily basis. Could the mid-priced U12 Life model be a more reliable bet? The new 6in smartphone has a Full HD+ display (2160 x 1080) with 18:9 aspect ratio, a 3.5mm audio jack alongside a USB-C port for charging, and comes with Android 8.1 (Oreo) built in. That’s all well and good, but most pertinently, it has a 3600mAh battery. Compared with the 3500mAh found the flagship U12+, that surely seems a step up. With the cheaper Life model sporting a less demanding screen thanks to its LPTS (Low-temperature polycrystalline silicon) panel, it should last a lot longer into the day than the power-hungry U12+. Elsewhere, the features on the midrange model are just a step down from the flagship, but still decent for its price. The main dual 16MP and 5MP cameras can also shoot videos in 4K/30fps or 1080/60fps, while the front 13MP camera uses a real LED flash. Both cameras support HDR. The phone won’t play 24-bit hi-res audio, but it does support Bluetooth 5, aptX HD, and features stereo speakers in landscape. The U12 Life model is encased in HTC’s shimmery ‘liquid surface’ design, and comes in two dual-toned finishes of moonlight blue and twilight purple. To combat the slipperiness of the glass design and stop it being covered in fingerprints, the back of the phone is half covered in 0.3mm ‘3D’ raised stripes – it stops just short of the fingerprint sensor. 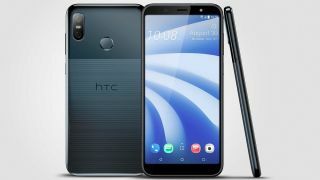 Available in 64GB and 128GB storage variants (which can be expanded thanks to an SD card slot), the HTC U12 Life will be available from just £299 in late September.